Join us in urging Israeli authorities to ban imports from slaughterhouses that engage in this barbaric practice. “The shackling and hoisting shown in this video is a violation of all industry and international welfare guidelines.” —Dr. Temple Grandin, renowned animal-welfare expert. Shockingly, representatives of the office of the chief rabbi of Israel previously defended the kosher status of “shackle and hoist” beef, reportedly declaring that “gratuitous cruelty” does not “disqualify the meat” as kosher. But as this new video has exposed, these promises have not been kept. Sixty to 80 percent of the beef exported to Israel is still produced using “shackle and hoist” slaughter. So why does the Chief Rabbinate of Israel continue to certify such a primitive and cruel practice when there are other methods of kosher slaughter that use more modern equipment and cause less suffering? “Shackle and hoist” slaughter only persists because it’s faster and cheaper to disregard animal welfare. 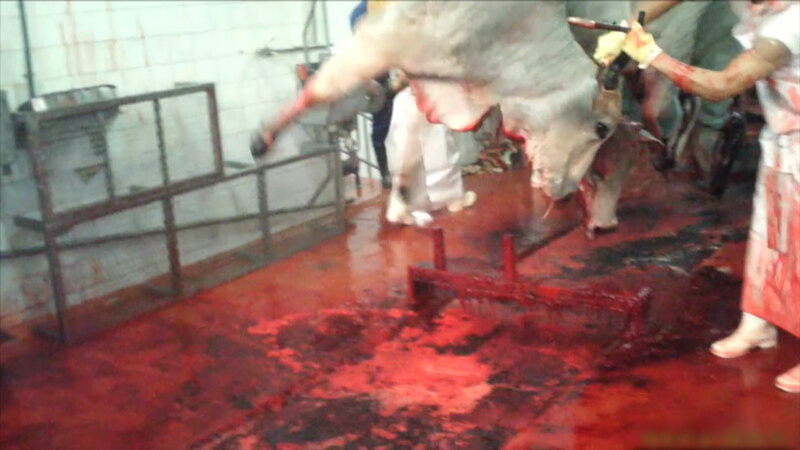 This carefully calculated cruelty allows slaughterhouses to kill more than 90 cows per hour. “Shackle and hoist” slaughter is almost twice as fast as less agonizing methods. This is the hidden cost of cheap kosher meat. The cows are paying the price. Bitten to Death by Sand Flies: Infected sand flies are strapped to a beagle’s bare skin, causing painful ulcers. Others are infected with “lethal doses” of anthrax. Forced Heart Attacks: “Snares” are tightened around dogs’ coronary arteries to induce heart attacks before they’re killed and dissected by government bureaucrats. As I write this, my team is holding a bipartisan congressional briefing with hosts Rep. Dina Titus (D-NV) and Rep. Ken Calvert (R-CA) on Capitol Hill. Our goal? To rally more congressional support for an immediate audit into these secretive taxpayer-funded dog experiments. Expanded Advertising: We’ll fund more advertising to pass common sense transparency and accountability measures. Innovative Legislation: We’ll rally even more Republicans and Democrats to audit, investigate, and de-fund the dog labs. So please, follow this link to double your donation, and help us sustain our bipartisan momentum in Congress. P.S. As I write this, my team is holding a bipartisan congressional briefing with Rep. Dina Titus (D-NV) and Rep. Ken Calvert (R-CA) on Capitol Hill. Our goal? To audit, investigate, and eventually de-fund the government’s dog experiments we just exposed in today’s Washington Post. Can I count on your tax-deductible contribution against taxpayer-funded dog abuse? Thanks – Anthony. White Coat Waste Project is a 501(c)(3) bipartisan coalition of 350,000+ liberty lovers and animal lovers opposed to the government’s wasteful spending on animal experiments. Our mission? To stop taxpayer-funded animal experiments. National Review calls it a “refreshing consensus-building argument.” Our work has been profiled by US News & World Report, Fox News, Huffington Post, Washington Examiner, TheBlaze, Breitbart, One Green Planet, RedState, and Daily Caller. Contributions are tax-deductible.